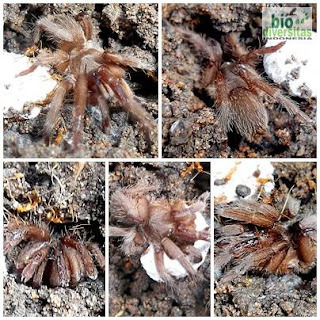 Borneo has a variety of exotic arthropod species, such as type of tarantula. In contrast to the general type of tarantula, tarantulas from Borneo Island is usually smaller, but has a relatively unique color. Borneo has many types of tarantulas are still unknown, the two names that are well known are the Borneo Black Tarantula (Lampropelma sp. ), And Phlogiellus sp. Both are commonly used as pets. However, to date stock inventory generally still rely on natural and still very little breeding effort. In nature, it is the predators who hunt various species of insects, small mammals and amphibians. Active at night so it is also known as nocturnal animals. 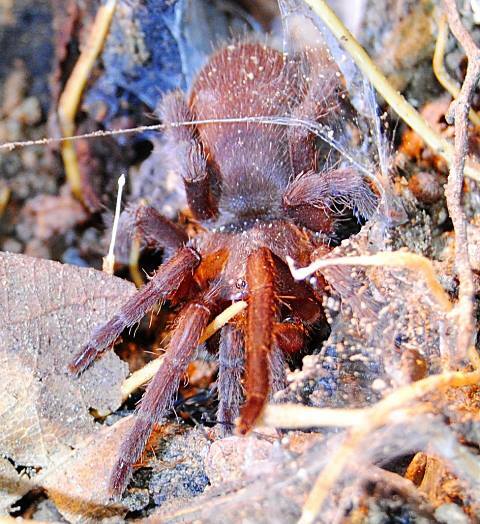 Tarantulas have fangs that can inject venom used to paralyze prey and as a form of self-defense mechanism. This animal trade should remain in control to prevent population decline tarantulas in their natural habitat. Breeding efforts should begin to be increased to meet the need for a fan in order not to disrupt the continuity of tarantula species. Tarantulas are wild animals and venomous, although to date there are almost never reported death from a tarantula bite, but for those who keep tarantulas should not hold without using gloves. Tarantula is one of the various species of spiders in the world. Do not keep a tarantula if not yet know in detail about handling tarantulas. Tarantula the size varies from a few centimeters to tens of centimeters.